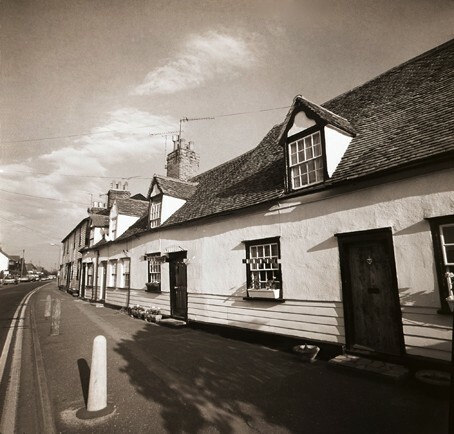 I found this Rochford image of only 22 years ago among my old negatives. I haven't been to Rochford lately and wonder if the scene has changed? It looks marvellous in my view, like it's been forgotten by time and progress, except for the TV aerials, of course, and the double-yellow lines. At the time an old smithy had been pulled down, I think in North Street, and I was approached by a stranger who was heartbroken at the thought of losing such an icon from the past. At the time I wished I'd passed there before the destruction. Commuting to London in those days, an architect friend confided they had redesigned a cottage in North Street and found a priest's hideout behind a fireplace. Or it might have been a smuggler's den? Is there any truth to that story? This page was added by Robert Hallmann on 24/12/2011. This is a view of Weir Pond Rd, looking from the North St end towards Stambrridge Rd. I used to live in Weir Pond Rd opposite what was the old British Legion Hall (now a block of flats)The old smithy was almost opposite the end of Weir Pond in North St and used to be run by Mr Bacon and his son who also lived in Weir Pond rd. I used to watch them work when i was a child.